About a week ago I did something I haven't done in a long time. I ate at the same pizza joint for the third time in just 4 months time. I do try to spread my return visits over a much bigger time span, but The Good Pie is just so good it couldn't be helped. It goes something like this: It's my birthday and I'll eat pizza if I want. I had Family in town and they wanted to celebrate my birthday (a little early) and due to other family business we ended up just down the street from The Good Pie and the rest is history. There were 5 pizza eaters and one junior pizza eater, we stared with the white anchovy panzanella and the prosciutto, fried egg and bread appetizers. Most all got the chopped salad. For pizza we had the following: Pizza del giorno (brussel sprouts, pancetta, pecorino and fresh mozzarella), Margherita (tomato, fresh mozzarella and basil), Sausage (tomato, sausage and fresh mozzarella), Mast'nicola (pancetta, basil, egg and pecorino) and the Prosciutto Arugula (prosciutto di parma, arugula and fresh mozzarella). Once we had our fill and had no room for more we ordered gelato, one stracciatella and one chocolate. Needless to say we all left fat and happy. I could go into great detail about all the things we ate, but I will let the photos speak for them selves. I will say just go there already! 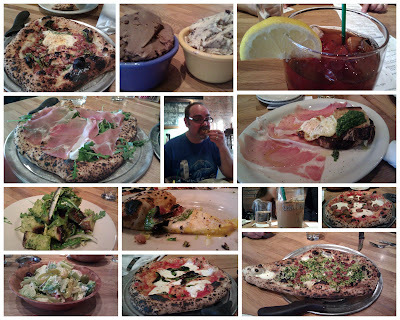 The Year in Pizza, 2010. The Good Pie, December 2010.